Winsor & Newton Artists' Oil Colour owes its reputation for supreme quality to the careful selection of the very finest pigments. By exercising maximum quality control throughout all stages of manufacture, selecting the most suitable drying oils and method of pigment dispersion, the unique individual qualities of the colours are preserved. To produce colours of reliable consistency and a high standard of colour matching demands a combination of the traditional crafts of the artists' colourmen and modern colour technology skills. The 120 colours in this range each contain the maximum pigment content consistent with good handling qualities, and so achieve the optimum tinting strength when reduced with white. 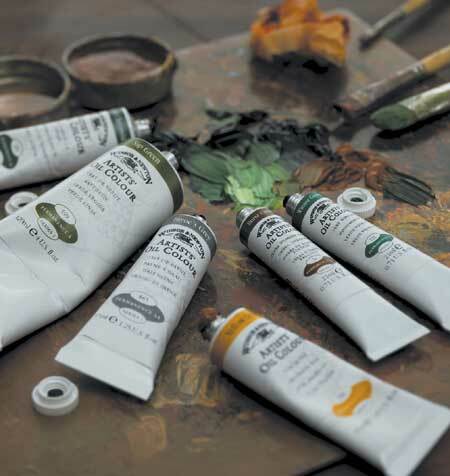 The Winsor & Newton range of Artists' Oil Colour is unmatched for purity, quality and reliability, a success which is reflected in its worldwide reputation amongst professional artists. Winton is the standard artist range. 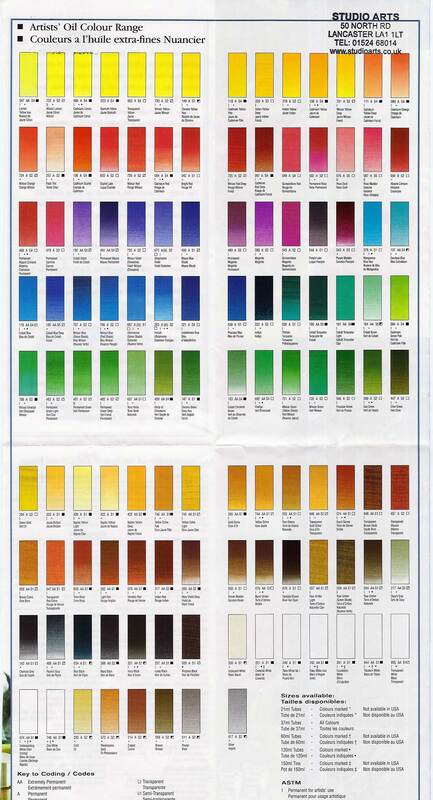 The 120 colours in this range each contain the maximum pigment content consistent with good handling qualities, and so achieve the optimum tinting strength when reduced with white. The Winsor & Newton range of Artists' Oil Colour is unmatched for purity, quality and reliability, a success which is reflected in its worldwide reputation amongst professional artists. Pigment Strength : Artists Oil Colour uses the highest level of pigmentation consistent with the broadest handling properties. The individual characteristics of each pigment are maintained allowing individual characteristics to be explored by artists. Pigment strength provides covering power and tinting strength, leading to the saying artists quality goes further ‚ Covering Power Covering Power not only comes from pigment strength, but also from the greater thickness of colour, which results from the stiff consistency associated with Artists Oil Colour. Covering power is particularly linked to the most opaque colours like Titanium White and the Cadmiums. Pigment Purity Like all raw materials, pigments are available in various grades. We use only the purest of pigments ensuring the cleanest, brightest colours, which produce the best colour mixtures. according to mass tone [colour from tube], undertone [bias of colour when in a thin film], strength and relative opacity. This provides the largest number of colour positions and an infinite number of colour mixtures. A total of 100 different pigments are used to produce 120 colours. Our quality standards include the use of single pigments wherever possible to create individual colours. Combined with strength of colour, single pigments provide a wide colour range in themselves and offer cleaner, brighter mixtures with an infinite range of hues. This is particularly important for greens, violets and oranges. Single pigment secondaries ‚¬ „¢ considerably broaden the artists ‚¬ „¢ available spectrum. There are 80 single pigment colours in the range. Colour, together with the smell of linseed oil, are the two characteristics most admired by oil painters. These qualities are unbeaten by other media. The stiff consistency of Winsor & Newton colours can retain brush or palette knife marks or it can be thinned to the very finest of glazes. Foundation and Cremnitz Whites [lead]. Winsor & Newton Liquin is the perfect medium to speed the drying time of oil colour. It will speed drying by approximately 50%. Since white is the most commonly used colour, appropriate selection is vital. Artists Oil Colour offers the widest choice of oil colour whites. Titanium White Oil Paint ; The most popular modern white. It is the whitest, and the most opaque. Where its strength is overpowering, alternative whites can be used. Flake White No. 1; The traditional lead white that is excellent as a result of its flexibility, durability and speed of drying. The inclusion of zinc pigment improves its consistency. It is warmer than Titanium White and firmer in consistency. Zinc White; The least opaque traditional white making it ideal for tints and glazing. It has a blue undertone. Cremnitz White; also made from lead. The absence of zinc gives a long extended mark and a stringy consistency. The perfect alternative for artists who prefer a pure lead colour, similar to that used by the Old Masters ‚¬ �. It is fast drying. Iridescent White; A mica based pigment which makes a pearlescent white. It is effective when mixed with transparent colours, and used over dark underpainting. Zinc White. Ideal for tonal mixtures and glazes and for those wishing to avoid opacity and covering. A medium drier, it will produce the very strongest tints. Flake White Hue; A titanium based formulation which avoids the hazardous lead based Flake White No. 1. It has a lower tinting strength than Titanium White to match Flake White and a similar drying rate to the original. Note: Safflower whites are not recommended for extensive underpainting or priming. The slow drying nature of the oil may cause subsequent layers to crack. Linseed oil whites are recommended. Underpainting White (fast drying); A titanium pigment ground in linseed oil which is recommended for underpainting or extensive layering with white. It dries quickly to a flat, matt, toothy finish. Foundation White; A lead pigment ground in linseed oil which is recommended for priming or extensive layering with a lead white. Both linseed oil whites can be used throughout the painting if desired. Please refer to the technical section of our website for more comprehensive details on our whites and the other main colour groups. White is the most commonly used colour in oil painting from the earliest stages through to finishing touches and highlighting. However not all whites are the same. Each of the whites in the Georgian Oil range has its own distinctive properties. Understanding how they perform helps the artist to choose the right white for the painting in progress. Titanium White Highly opaque bright white with exceptional covering power for strong highlights. It can also be used for mixing and is a good all purpose white. Mixing White Cool permanent white with lower reducing strength than other whites for greater control when blending to create more precise pale tints. Zinc White Less opaque slower drying white, used in the later stages of a painting for subtle highlighting, glazing and blending with other colours to create pale tints. Underpainting White Exceptionally stable, highly opaque white specially formulated to resist cracking and shrinking in the early stages of a painting. Flake White The Old Masters ‚ White, based on lead pigment, suitable for all stages of a painting. It is a high performance milky white, noted for its opacity and durable paint film. When mixed with other colours it creates pure clean tints with minimum loss of tonal value. Classified as toxic according to EC legislation and available only in tins for EC countries. Every Artists Oil Colour is individually formulated to enhance each pigment's natural characteristics and ensure the stability of individual colours. Combined with over 170 years of manufacturing and quality control expertise, the formulation of Artists ‚¬ „¢ Oil Colour ensures the best raw materials are made into the World's Finest Colours. Since 1832 we have been developing permanent alternatives for the less durable traditional colours, without compromising the handling properties of the oil colours. As a result, the permanence of the colour range as a whole has been improved beyond the dreams of past painters. Of the 120 colours in the range, 119 are now classed as permanent for artists' use ‚ [AA or A ratings from Winsor & Newton] which aids in the longevity of paintings. Although Alizarin Crimson is only given a ‚ rating (moderately durable), it has been part of Artists ‚ Oil Colour for over 130 years and is still considered a key colour by many contemporary artists. For a more detailed explanation of permanence and the individual rating of each colour see the Technical Section or visit our website at www.winsornewton.com. Winsor & Newton are trusted by more artists than any other brand worldwide. This is a result of the quality and permanence of Artists ‚¬ „¢ Oil Colour and from the reliability of our production supply. Whether its hue, opacity or drying time the artist seeks, they can be sure to get the same product time and time again. The three primary colours in the Artists ‚¬ „¢ Oil Colour range are Transparent Yellow, Winsor Blue [Red Shade] and Permanent Rose. These colours are the best selection when only three colours are used. We recommend Winsor Lemon, Winsor Yellow, French Ultramarine, Winsor Blue [Green Shade], Permanent Rose and Cadmium Red when using a six colour mixing system. Mediums are a great "tool" for the classical oil painter, when they are made and applied properly. There are many that have been pre-made for the retail market that are available, and ready to use as is, right off the shelf. There are also extremely complicated, and sometimes dangerous recipes that the artist can make themselves, if they dare. I would like to show you how to make some simpler ones that do not involve "cooking" the mediums, and can use items that are readily available to most artists either from their local art store, or from online sources. 1. When does one use these mediums? 2. Which ones can the artist use to get a particular result? 3. What are some of the recipes that can be made, easily, and safely, at home? The various oils used as mediums in oil painting are known as drying oils. The term is useful as a reminder that different oils have different drying times and properties. These mediums are mixed with oil paint both to modify the way the paint handles straight from the tube (for example, make it thinner or lengthen the drying time) and to alter the character of the paint from what you get straight from a paint tube (for example, make it transparent or opaque, gloss or matt). Ideal mediums are colourless, permanent, flexible, and do not influence the colour of a pigment. Learning the particular properties of a drying oil is part of the essential technical knowledge an oil painter should have. Remember that when an oil paint feels dry to the touch, it will still be drying under the surface for some time, which is why the principle of painting 'fat over lean' is so important in oil painting. There are many other generic mediums that do not list their ingredients, only their effects, that are listed as Artists', Fat, Smooth, Lean, Colourless, Classic, etc. medium. But the following mediums are of at least partially known ingredients and are readily available on the market today. Copal resin painting medium, and Flemish Siccative: Is a copal resin based quick drying medium which yields a paint film with an enamelled-like appearance. Copal Resin, when it can be found, is today only used as an ingredient in mediums, and not in final varnishes so far as I know. Quality is non-uniform. Oil of Spike Lavender €œ It can be used as a medium to give body to the colour as well as a certain amount of bite, which improves adhesion to the lower layers. It can have the effect of either increasing or decreasing dry time, depending upon the other ingredients it is mixed with. If pure, it also works as a diluent, and was widely used in the middle ages. It Dries more slowly than Turpentine, allowing the artist to work wet in wet. Duroziez Harlem Siccative Medium €œ Will speed the drying of oil colours and brightens the hues of colours. It is a form of drying medium used by academic painters of the late 19th century invented by a Mr. Durozier of France. Critics say that the original siccatif de Haarlem and siccatif de Courtrai both contains ingredients that turn dark, brittle and crack. Cobalt drier is recommended as the least harmful drier to add to paint films; little is needed. (Griffin Alkyd mediums may be a safer modern additive which when added to oil paint allows to dry quickly ). Alkyd mediums are an oil paint medium that dries quickly like Liquin, are linseed oil modified alcohol-acid synthetic resin and has quickly becoming the Favorite of artists to speed drying. Having linseed oil as its base, it is compatible with all oil colours, does not show the tendency to discolour or crack, and will not continue oxidation of the paint film beyond its proper drying level. It is best used with OMS as a thinning agent rather than turpentine. Historically, courtrai drier has darkened and cracked. Since the 1850s, cobalt drier has proven useful when added to glazing mediums containing stand oil, pure gum turpentine and damar varnish. Cobalt drier is said to be the least harmful natural drier to use in glazing mediums. Flemish Medium - This gel medium is made with gum mastic and is used to recreate the effects put into practice by the Flemish masters, i.e.. Vermeer. Perfect for brilliant and precise detail work. Finished paintings have a luminescent, glossy appearance. This is most likely a form of Megilp, or mastic melted into boiled linseed oil and litharge or lead dryer such as Maroger. Venetian Medium - Made of mastic and wax this medium will give the paint film a satin sheen. It will facilitate impasto work and superimpositions while regulating the drying process. Wax Medium - When mixed into oil colours this non-yellowing wax and resin mixture actually strengthens the paint film against shrinkage and cracking and seals out dirt, air and moisture. Wax mediums have been used throughout history. Refined Linseed Oil: made from the seeds of the flax plant. It adds gloss and transparency to paints and is available in several forms. It dries very thoroughly, making it ideal for underpainting and initial layers in a painting. Refined linseed oil is a popular, all-purpose, pale to light yellow oil which dries within three to five days. It is used universally as a stand alone medium for oil paint or can be mixed with other ingredients to achieve a custom medium. Sun-bleached Linseed Oil: is created by exposing the oil to the sun but with the container's lid on, so no evaporation occurs. The result is an oil that has fewer tendencies to yellow. Sun Thickened Linseed Oil: used the same as refined but is much thicker, and can darken light coloured pigments. Good in impasto work. It is created by exposing the oil to the sun to create a thick, syrupy, somewhat bleached oil, with similar brushing qualities to stand oil. Pour some oil (about an inch) into a wide dish, cover it with a propped-up lid (i.e. to minimize debris getting in, but so that the air can flow through). Stir every day or so to prevent a skin from forming on the top. How long it takes for the oil to thicken will depend on how hot the climate is where you live. Test the thickness of the oil when it's cool, not when it's still hot from the day's sun. Pour it through a sieve or cloth to remove debris before you bottle the oil. As linseed oil has a tendency to yellow as it dries, avoid using it in whites, pale colours, and light blues (except in underpainting or lower layers in an oil painting when painting wet on dry). Stand oil and sun-thickened oil yellows very little. Poppy seed Oil: is a very pale oil, more transparent and less likely to yellow than linseed oil, so it is often used for whites, pale colours, and blues. It gives oil paint a consistency similar to soft butter. Poppy seed oil takes longer to dry than linseed oil, from five to seven days, making it ideal for working wet on wet. Because it dries slowly and less thoroughly, avoid using poppy seed oil in lower layers of a painting when working wet on dry and when applying paint thickly, as the paint will be liable to crack when it finally dries completely. Poppy seeds naturally contain about 50 per cent oil. Walnut Oil: is a pale yellow-brown oil (when newly made it's a pale oil with a greenish tinge) that has a distinctive smell. As it's a thin oil, it's used to make oil paint more fluid. As it yellows less than linseed oil (but more than safflower oil) it's good for pale colours. Walnut oil dries in four or five days. It's an expensive oil and must be stored correctly otherwise it goes rancid (off). Walnuts naturally contain about 65 per cent oil. It is a good drying oil. Since it is said to yellow less than linseed, it may be good to mix with amber or copal to reduce yellowing that may occur with these hard resins. Black Walnut Oil: dries through oxidation when exposed to air. Black oil does not have a tendency to yellow which makes it a highly reliable mixing oil. It may be worked in directly to colour or in combination with turpentine. When mixed with Black Oil, colours develop a more durable, flexible paint film, allowing you to work the next day without disturbing lower paint layers. It was definitely a favourite of 15th Century painters. But can be difficult to find. Safflower Oil: has the same characteristics as poppy seed oil, but dries a bit faster. It's made from safflower seeds. Not the one from the grocery stores! Sunflower oil: also have similar characteristics to poppy seed oil. It's made from sunflower seeds. Not the one you get in the grocery stores! Boiled oils: are oils that have been heated and mixed with a dryer to create a faster-drying oil that gives a glossy finish. They tend to yellow and darken with age, so are best limited to lower layers in a painting and darker colours. If you're not sure what affect an oil is going to have, I suggest that you take the time to do a test rather than loose or damage a whole painting. Venetian (or Venice) Turpentine: Is in the oleoresin category.. The judicious use of Venetian Turpentine will add lustre and gloss to glazes. Extremely high percentages of oleoresin would make the paint film dangerously resoluble when cleaning. Now that I have addressed the different oils and pre-made mediums that are available to most artist thru the retail environment, let's get to the recipes, shall we! First, any one of these pre-made mediums can be used alone to get the stated appearances to your paintings as can many of the drying oils. But the reason for this article is for you to understand the preparation of custom, but simple mediums that are as similar to the ones made and presumed used by the Masters of Classical Oil Painting. That being said, the first two are pretty basic, and will give you good control when glazing methods are employed. This is a good one for typical classical glazing techniques. This recipe is a bit harder to learn to use, but it can give your paint a stained glass effect. 4 parts Italian maroger 2 parts beeswax 1 part English turpentine (add a second part for the bistre) 2 parts stand oil 1 part Venetian turpentine. This medium gives your paint a translucent quality. The light can still transmit through it and bounce back from the underpainting and primer ground. For multiple layering add a little more stand oil to each layer. This recipe will add gloss more safely than the use of a boiled oil hard resin medium. It will also give your paint a stained glass appearance and those beautiful diffuse highlights that Vermeer had! All of these medium recipes can be thinned with rectified turpentine as needed, depending on what layer you are working on i.e. the verdaccio up through the final glaze layers. All mediums should be mixed in quantities that can be used within a six month period. They should also be stored in glass jars sealed tightly with lids ( I use the kind you get in the grocery stores for canning vegetables or fruits) and kept in a cool dry area when not in use. Remember all these materials can be harmful if used improperly. And Of course they should be kept safely away from children and pets! Surfaces and Primers - Stretched, primed canvas is the traditional support for oil colour. Canvas boards are also popular. Our Winsor Canvas, Winsor Linen or Winsor Board (not available in the USA) are recommended for the artist wanting to exploit a variety of techniques and ensure long term stability. Paper can also be used, provided it is sized and primed correctly. Heavyweight Winsor & Newton Water Colour Paper primed thinly with Acrylic Gesso Primer is ideal. Solvents are used to dilute colours and to clean brushes and equipment. English Distilled Turpentine makes a viscous mixture which evaporates slowly. It is the most hazardous and strongest smelling solvent, and can deteriorate on storage. Artists ‚¬ „¢ White [or mineral] Spirit (not available in the USA) makes a watery mixture which evaporates quickly and is less hazardous. It does not deteriorate on storage. Sansodor €ž ¢ makes a viscous mixture, which evaporates slowly, and is the least hazardous. It does not deteriorate on storage, has a minimal odour and can be travelled with safely. Oils and mediums alter the handling characteristics of the colour and help to maintain the flexibility of the finished painting (fat over lean) Oils are the traditional, slower drying choice whilst alkyd based mediums, such as Liquin Original and Fine Detail, are favoured due to their speeding the drying time of the painting. Varnishes are used to protect finished paintings. For fine art usage, picture varnishes should be removable so that the painting can be cleaned in the future. Our varnishes are labelled gloss ‚¬ � or matt ‚¬ � and vary according to the different resins used. Brushes - To thickly apply colour or impasto, bristle brushes are most common. Winsor & Newton have three ranges, Artists Hog [Rathbone in USA], Winton and Azanta . The stiff nature of the bristle and its natural split tips, (called flags), result in brushes which wear well and carry considerable quantities of colour. To blend and glaze, a soft hairbrush is recommended such as Cirrus sables or Sceptre Gold II which are a blend of natural and synthetic fibres. Palettes - Mahogany palettes are the traditional palette for oil colour. However, because canvases are primarily white, white melamine palettes are often preferred by modern painters together with expendable paper palettes which can be disposed of at the end of each painting session.